Honest Gold Guy Spokane Valley is a sterling silver buyer. While only a fraction of the price of gold, sterling silver can add up to a big payout if you have enough of it. If you're looking to sell sterling silver you've found the right spot. We are sterling silverware buyers, sterling silver jewelry buyers, silver flatware and holloware buyers, and silver coin buyers. Here is some info about the sterling silver we buy and some tips to help determine if your items are really sterling silver. If you’re not sure, just bring them in and we’ll be happy to check them, test them, and make you an offer on the spot. 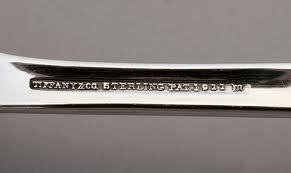 Most sterling silverware is plainly marked with the word sterling on it. Occasionally we see European or foreign sterling silver that has other markings which indicate it is sterling silver. For example the image of a lion facing to the left with one paw up is a sterling hallmark. 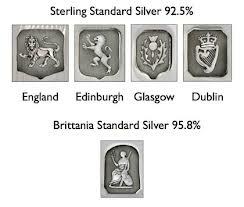 See the images below to help you identify sterling silver items. 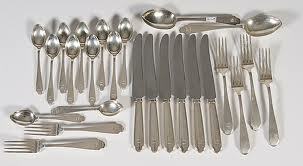 99.9% of the sterling silverware we see is clearly marked. Plated silverware is usually marked as plated, silver plate, EPNS, or has no marks at all. Although it is extremely rare, sometimes the hallmark may be missing or worn off. If you're not sure, please feel free to bring in your items and we can easily test to see if they are in fact sterling silver. Silver jewelry is often sterling however it is usually marked with the number 925 on the clasp or on the inside of a ring. Sometimes there is no mark on handmade jewelry or the mark may be located in an odd location. Unfortunately, much of the department store jewelry that claims to be silver is not. We will have to test all jewelry. Even many marked items are not genuine. If you're ready to sell sterling silver please give us a call or come see us.